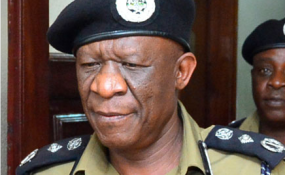 Kampala — Inspector General of Police Martins Okoth-Ochola has reshuffled about 129 senior police officers, with regional and district police commanders the most affected. In a message sent on Saturday, at least 38 senior police commanders were sent on course at the Senior Command and Staff College in Bwebajja, Wakiso District, and they are to start training on April 1. Another 91 regional and district commanders were shuffled. According to the message, Commissioner of Police Godfrey Ireidwenge has been transferred from the Directorate of Human Resource Management to the Ministry of Internal Affairs where he will head the department of small arms and light weapons. Mr Moses Binoga, who has been the coordinator of anti-human trafficking in the Ministry of Internal Affairs, has been sent to the Human Resource Management and Development for redeployment. He has been instrumental in intercepting human traffickers between Kenya and Uganda and rescuing girls. No one has been appointed in Mr Binoga's old position. Mr Stephen Musoke has been sent to the Department of Police Inspectorate from Human Resource Directorate. Among those sent on course are Ms Esther Akwango, Ms Sarah Kibwika and head of Child and Family Protection Department Morine Atuhaire. Zurah Ganyana has been moved from the Public Relations department for a course. Mr Roman Otooro, who joined police in 2007, has been appointed deputy commandant of the Police Training School in Kabalye.